The mayor of Esztergom, Éva Tétényi (Independent) thought she would surprise her male co-workers with a little treat, a female bellydancer to perform in the town hall, RTL Klub reports. The local section of the FIDESZ party reacted immediately to the news about this saying that a town with billions of HUF in debt does not have room for such events. Mayor Éva Tétényi replied that the belly dancer gave her performance for free, in exchange for some chocolate. The champagne was also bought in by the spectators, so no tax money was spent on the event, she also highlighted that under the previous local government over 23 million HUF was spent each year on events like this. Terminal 1 at Budapest Liszt Ferenc (former Ferihegy) airport is now closed. After Malév went under in February the traffic at the capital’s airport has been too low too keep both terminals operating. Terminal 2A, that was dominantly trafficed by Malév can together with 2B host all passenger flights to the airport. This means that as of tomorrow morning Jet2.com, Norwegian Air Shuttle, Easyjet, Germanwings and Wizz Air will operate from Budapest Airport Terminal 2. Terminal 1 will be sealed off, the airports administration will still remain in the terminal building, and the apron will still be used by cargo aircrafts and general aviation currently utilizing the fascilities. The Martyr Monument located by the Danube shore in Budapest has been vandalized with the Star of David and writings in Hungarian spraypainted on them. 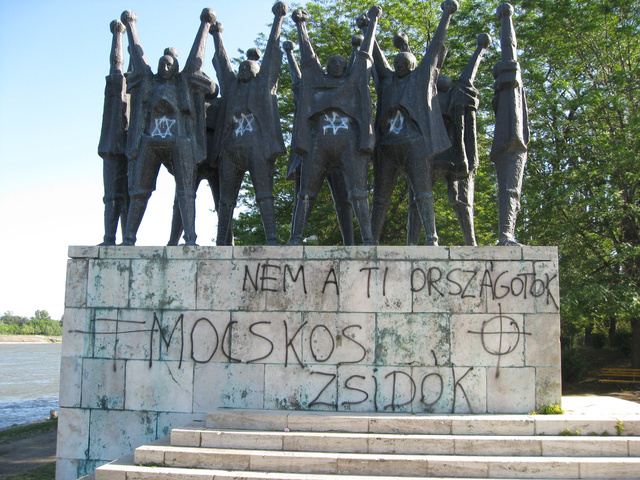 The writings read “It’s not your country – dirty jews”, as well as “You will be shot into there” (Referring to the Danube) and “Say hi to Daniel”. Referring to the man who last week painted red a recently unweiled statue of Miklos Horthy. writes index.hu.